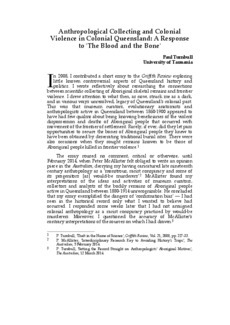 In 2008, I contributed a short essay to the Griffith Review exploring little known controversial aspects of Queensland history and politics. I wrote reflectively about researching the connections between scientific collecting of Aboriginal skeletal remains and frontier violence. I drew attention to what then, as now, struck me as a dark, and in various ways unresolved, legacy of Queensland's colonial past. This was that museum curators, evolutionary anatomists and anthropologists active in Queensland between 1860-1900 appeared to have had few qualms about being knowing beneficiaries of the violent dispossession and deaths of Aboriginal people that occurred with movement of the frontier of settlement. Rarely, if ever, did they let pass opportunities to secure the bones of Aboriginal people they knew to have been obtained by desecrating traditional burial sites. There were also occasions when they sought remains known to be those of Aboriginal people killed in frontier violence.